The Pentax 20-40mm f2.8-4 DA ED Limited DC WR Lens Black is a wide-angle zoom lens ideal for shooting a variety of subjects, including landscapes, group shots, interior work and night shots. Equipped with multi-layer HD coating, the Pentax 20-40mm lens reduces reflectance in the visible light spectrum and ensures crisp, high-contrast images with minimal flare and ghosting, even under demanding light conditions. This Limited Series lens with weather-resistant construction features seven special seals to prevent intrusion of water, moisture and dust. 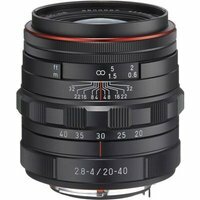 Its large F2.8-4 aperture and rounded diaphragm blades produce stunning bokeh and the direct current (DC) focus motor provides quiet and smooth autofocus.